This entry was posted on August 3, 2014 at 11:48 am and is filed under climate, CO2, temperature. You can follow any responses to this entry through the RSS 2.0 feed. You can leave a response, or trackback from your own site. Thanks Ken. I was not aware of Steve Goddard’s announcement. R^2 at 0.988? GISS may as well have plotted all values on the line. The Australian correlation is not 0.99, but at 0.78 its still very good. 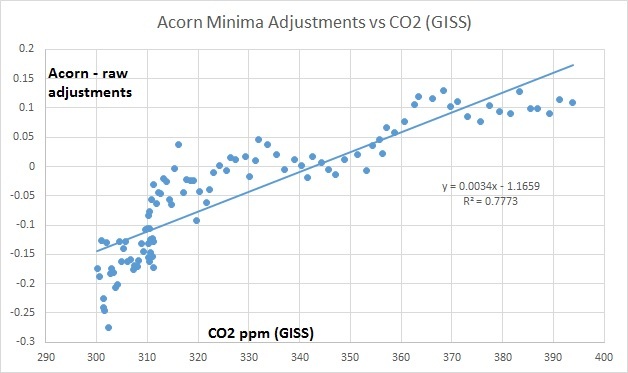 With atmospheric CO2 on the X-axis essentially a proxy for the date, the new Goddard plot of CO2 ppm plus the RAW-ACORN adjustment together on the Y-axis vs year on the X-axis would also be interesting. 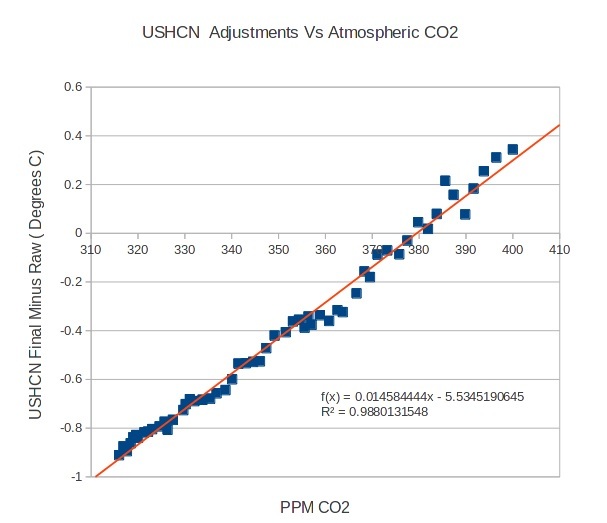 Doesn’t it just show that BOM have systematically lowered older temperatures, and raised modern temperatures to match the rising CO2 plot? Isn’t is suspicious that all of the earliest temperature adjustments are a lowering? What if GISS in the USA, BOM in Australia, NIWA in NZ and Met Office in UK have all systematically adjusted raw temperature data the same way? Dave, it just shows that raw temperatures were adjusted down in the past. The correlation with date is far better- +0.91. I think you have to de-trend data before computing correlation coefficients, otherwise there is a very spooky correlation between my weight and the sea level, both of which have risen nearly linearly over the past few decades.